Fleas are the most common of all external feline parasites, and flea infestation in cats can cause a lot of discomfort to your cats. Now you can control flea infestation in cats with Revolution for Cats 15-22 lbs, 3 Month (Taupe), a topical cat flea medicine. 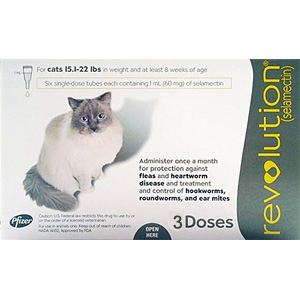 Revolution for Cats 15-22 lbs, 3 Month (Taupe) is a monthly, topical cat flea control and heartworm medicine that kills fleas, heals flea bites in cats and prevents heartworm disease. Instances of flea allergy dermatitis are reduced when cats are protected against flea bites with Revolution pet meds. Revolution for cats (selamectin), a topical parasiticide is available as a colorless to yellow, ready to use solution in single dose tubes for topical (dermal) treatment of dogs six weeks of age and older and cats eight weeks of age and older. The content of each tube is formulated to provide a minimum of 2.7 mg/lb (6 mg/kg) of body weight of selamectin. This Pfizer Animal Health cat flea control medicine and cat heartworm preventative medicine comes in different dosage for different needs. Buy this cat flea medicine as well as other heartworm medicine for cats online and control flea infestation in cats easily. Based in Texas, our pet pharmacy online offers high quality pet medications and drugs. We care of your pets! US Federal law restricts this cat medicine to use by or on the order of a licensed veterinarian. Revolution for dogs kills adult fleas and prevents flea eggs from hatching for one month and is indicated for the prevention and control of flea infestations (Ctenocephalides felis), prevention of heartworm disease caused by Dirofilaria immitis, and the treatment and control of ear mite (Otodectes cynotis) infestations. Revolution for dogs also is indicated for the treatment and control of sarcoptic mange (Sarcoptes scabiei) and for the control of tick infestations due to (Dermacentor variabilis). Revolution for cats kills adult fleas and prevents flea eggs from hatching for one month and is indicated for the prevention and control of flea infestations in cats, prevention of heartworm disease in cats caused by Dirofilaria immitis, and the treatment and control of ear mite (Otodectes cynotis) infestations. Revolution for cats is also indicated for the treatment and control of roundworm (Toxocara cati) and intestinal hookworm (Ancylostoma tubaeforme) infections in cats. This flea and heartworm medicine for cats is not for human use. Keep out of the reach of children. In humans, Revolution for cats may be irritating to skin and eyes. Reactions such as hives, itching and skin redness have been reported in humans in rare instances. Individuals with known hypersensitivity to Revolution for cats should use the product with caution or consult a health care professional. Revolution for cats heartworm preventative medicine contains isopropyl alcohol and the preservative butylated hydroxytoluene (BHT). Wash hands after use and wash off any product in contact with the skin immediately with soap and water. If contact with eyes occurs, then flush eyes copiously with water. In case of ingestion by a human, contact a physician immediately. The material safety data sheet (MSDS) provides more detailed occupational safety information. For a copy of the MSDS or to report adverse reactions attributable to exposure to this product, call 1-800-366-5288. Flammable – Keep away from heat, sparks, open flames or other sources of ignition. Do not use cat flea medicine in sick, debilitated or underweight animals. Following treatment with Revolution for cats, transient localized alopecia with or without inflammation at or near the site of application was observed in approximately 1% of 691 treated cats. Other signs observed rarely (≤0.5% of 1743 treated cats and dogs) included vomiting, loose stool or diarrhea with or without blood, anorexia, lethargy, and salivation, tachypnea, and muscle tremors. In addition to the aforementioned clinical signs that were reported in pre-approval clinical trials, there have been reports of pruritus, urticaria, erythema, ataxia, fever, and rare reports of death. There have also been rare reports of seizures in dogs. Administer the entire contents of a single dose tube (or two tubes used in combination for dogs weighing over 130 pounds) of Revolution topically in accordance with the following tables.. Firmly press the cap down to puncture the seal on the Revolution tube; a clicking sound will confirm that the cap has successfully punctured the seal. Remove the cap and check to ensure that the tip of the tube is open. To administer the product, part the hair on the back of the animal at the base of the neck in front of the shoulder blades until the skin is visible. Place the tip of the tube on the skin and squeeze the tube 3 or 4 times to empty its entire contents directly onto the skin in one spot. Keeping the tube squeezed, drag it away from the liquid and lift to remove. Check the tube to ensure that it is empty. Do not massage the product into the skin. Due to alcohol content, do not apply to broken skin. Avoid contact between the product and fingers. Do not apply when the hair coat is wet. Bathing or shampooing the animal 2 or more hours after treatment will not reduce the effectiveness of Revolution. Stiff hair, clumping of hair, hair discoloration, or a slight powdery residue may be observed at the treatment site in some animals. These effects are temporary and do not affect the safety or effectiveness of the product. Discard empty tubes in your ordinary household refuse. For the prevention and control of flea infestations in cats and dogs, Revolution for cats should be administered at monthly intervals throughout the flea season, starting one month before fleas become active. In controlled laboratory studies >98% of fleas were killed within 36 hours. Results of clinical field studies using Revolution monthly demonstrated >90% control of flea infestations within 30 days of the first dose. Dogs and cats treated with Revolution, including those with pre-existing flea allergy dermatitis, showed improvement in clinical signs associated with fleas as a direct result of eliminating the fleas from the animals and their environment. If the dog or cat is already infested with fleas when the first dose of Revolution is administered, adult fleas on the animal are killed and no viable fleas hatch from eggs after the first administration. However, an environmental flea infestation in cats may persist for a short time after beginning treatment with Revolution because of the emergence of adult fleas from pupae. For the prevention of heartworm disease in cats and dogs, Revolution must be administered on a monthly basis. Revolution may be administered year-round or at least within one month after the animal’s first exposure to mosquitoes and monthly thereafter until the end of the mosquito season. The final dose must be given within one month after the last exposure to mosquitoes. If a dose is missed and a monthly interval between dosing is exceeded then immediate administration of Revolution and resumption of monthly dosing will minimize the opportunity for the development of heartworm disease in cats. When replacing another heartworm preventive product in a heartworm disease prevention program, the first dose of this heartworm medicine must be given within a month of the last dose of the former medication. Selamectin, the active ingredient in Revolution, the best flea treatment for cats, is a macrocyclic lactone compound. These compounds effectively prevent the development of adult heartworms when administered to dogs and cats within one month of exposure to infective (L3) Dirofilaria immitis larvae. Efficacy of macrocyclic lactones decreases below 100% in dogs, however, if first administered >2 months after exposure to infective larvae. Thus, in heartworm endemic regions, delaying initiation of heartworm prevention using Revolution beyond 2 months of first exposure to infective larvae (e.g., starting puppies and kittens at >8 weeks of age), or gaps of >2 months in the administration of Revolution during periods of heartworm transmission, increases the risk of the animal acquiring heartworms. Animals with unknown heartworm history that test negative for heartworms prior to the initiation of Revolution may be harboring pre-patent infections at the time Revolution was started. Testing such animals 3-4 months after initiation of Revolution would be necessary to confirm their negative heartworm status. At the discretion of the veterinarian, cats ≥6 months of age may be tested to determine the presence of existing heartworm infections before beginning treatment with this cat heartworm preventative medicine. Cats already infected with adult heartworms can be given this heartworm medicine for cats monthly to prevent further infections. For the treatment of ear mite (O. cynotis) infestations in dogs and cats, Revolution should be administered once as a single topical dose. A second monthly dose may be required in some dogs. Monthly use of this medicine for cats will control any subsequent ear mite infestations. In the clinical field trials ears were not cleaned, and many animals still had debris in their ears after the second dose. Cleansing of the infested ears is recommended to remove the debris. For the treatment of sarcoptic mange (S. scabiei) in dogs, Revolution for dogs should be administered once as a single topical dose. A second monthly dose may be required in some dogs. Monthly use of Revolution will control any subsequent sarcoptic mange mite infestations. Because of the difficulty in finding sarcoptic mange mites on skin scrapings, effectiveness assessments also were based on resolution of clinical signs. Resolution of the pruritus associated with the mite infestations was observed in approximately 50% of the dogs 30 days after the first treatment and in approximately 90% of the dogs 30 days after the second monthly treatment. For the control of tick (Dermacentor variabilis) infestations in dogs, Revolution for dogs should be administered on a monthly basis. In heavy tick infestations, complete efficacy may not be achieved after the first dose. In these cases, one additional dose may be administered two weeks after the previous dose, with monthly dosing continued thereafter. For the treatment of intestinal hookworm (A. tubaeforme) and roundworm (T. cati) infections, this heartworm medicine for cats should be applied once as a single topical dose. Revolution for dogs has been tested safe in over 100 different pure and mixed breeds of healthy dogs and over 15 different pure and mixed breeds of healthy cats, including pregnant and lactating females, breeding males and females, puppies six weeks of age and older, kittens eight weeks of age and older, and avermectin-sensitive collies. A kitten, estimated to be 5-6 weeks old (0.3 kg), died 81/2 hours after receiving a single treatment of this flea and heartworm medicine at the recommended dosage. The kitten displayed clinical signs which included muscle spasms, salivation and neurological signs. The kitten was a stray with an unknown history and was malnourished and underweight. DOGS: In safety studies, Revolution for dogs was administered at 1, 3, 5, and 10 times the recommended dose to six-week-old puppies, and no adverse reactions were observed. The safety of Revolution administered orally also was tested in case of accidental oral ingestion. Oral administration of Revolution at the recommended topical dose in 5- to 8-month-old beagles did not cause any adverse reactions. In a pre-clinical study selamectin was dosed orally to ivermectin-sensitive collies. Oral administration of 2.5, 10, and 15 mg/kg in this dose escalating study did not cause any adverse reactions; however, eight hours after receiving 5 mg/kg orally, one avermectin-sensitive collie became ataxic for several hours, but did not show any other adverse reactions after receiving subsequent doses of 10 and 15 mg/kg orally. 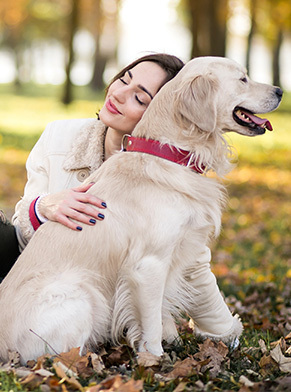 In a topical safety study conducted with avermectin-sensitive collies at 1, 3 and 5 times the recommended dose of Revolution, salivation was observed in all treatment groups, including the vehicle control. Revolution for dogs also was administered at 3 times the recommended dose to heartworm infected dogs, and no adverse effects were observed. CATS: In safety studies, Revolution for cats was applied at 1, 3, 5, and 10 times the recommended dose to six-week-old kittens. No adverse reactions were observed. The safety of Revolution administered orally also was tested in case of accidental oral ingestion. Oral administration of the recommended topical dose of Revolution to cats caused salivation and intermittent vomiting. Revolution for cats also was applied at 4 times the recommended dose to patent heartworm infected cats, and no adverse reactions were observed. In well-controlled clinical studies, Revolution for cats was used safely in animals receiving other frequently used veterinary products such as vaccines, anthelmintics, antiparasitics, antibiotics, steroids, collars, shampoos and dips. Store this pet meds below 30°C (86°F). This cat flea control medicine is available in seven separate dose strengths for dogs and cats of different weights (see Dosage). Revolution for puppies and kittens is available in cartons containing 3 single dose tubes. Revolution for cats and dogs is available in cartons containing 3 or 6 single dose tubes.